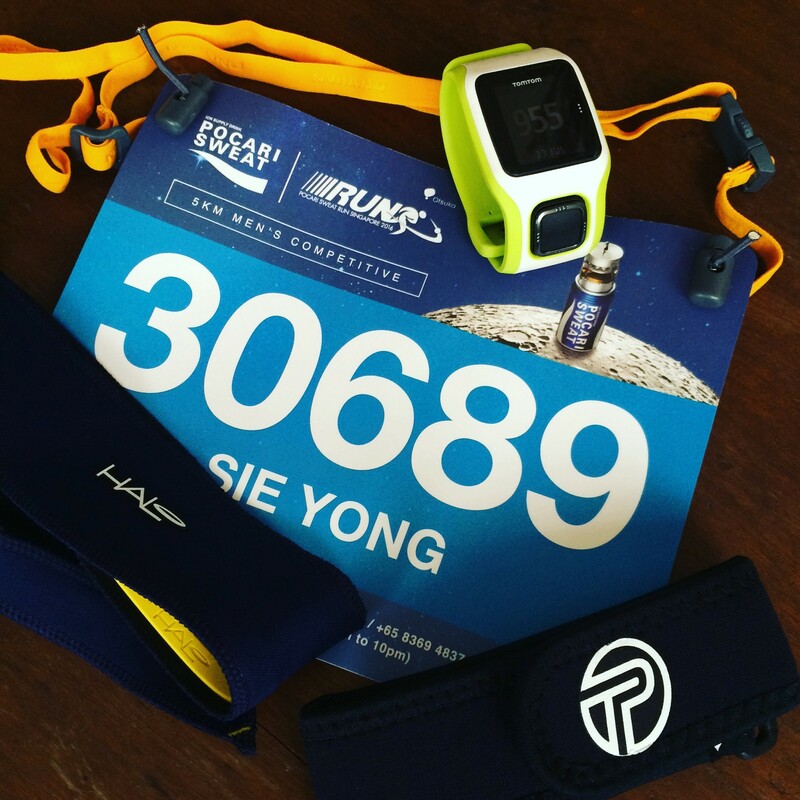 Race Review: Pocari Sweat Run 2016 [5km] (by SY) – Slow but Strong | JustRunLah! Sickness and injury are the twin nemesis of all runners. Once you are hit with either of these, it takes humility to accept the slowdown and focus on recovery and rehabilitation. 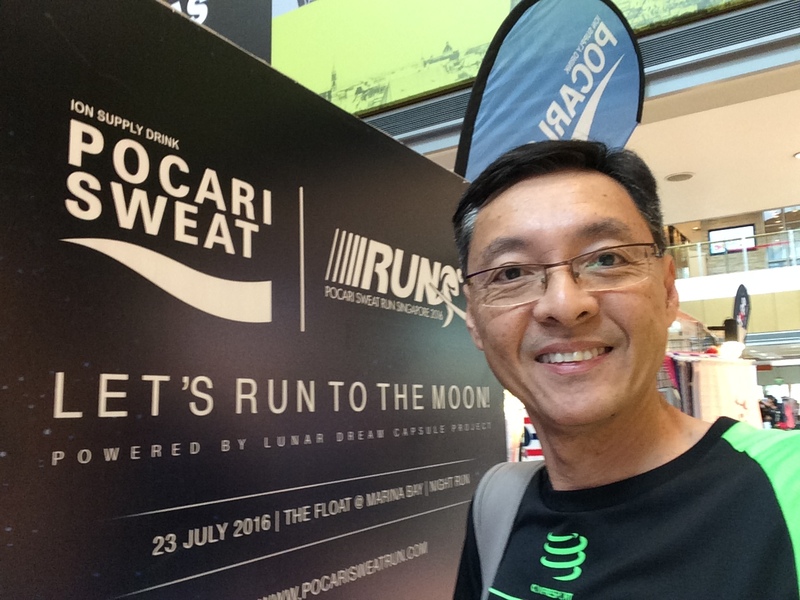 This happened to me recently, and I entered this Pocari Sweat Run 2016 with a half-rehabilitated knee. Here was my journey. 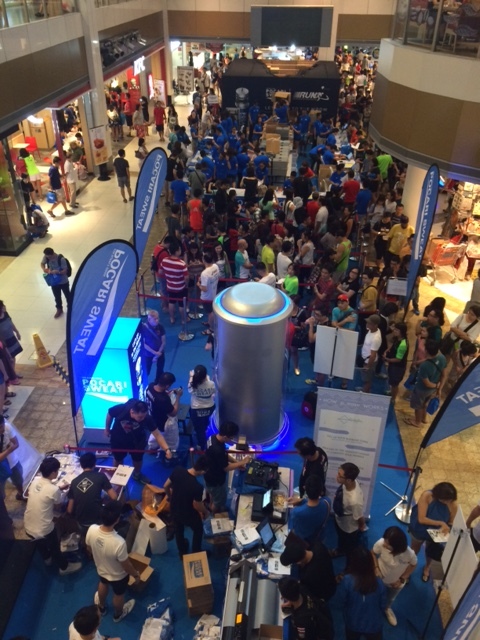 The queue snaked all the way from the atrium to outside of Novena Square. There and then, I had to decide to stay on or come back the next day. Still feeling upset that I wasn’t able to collect my race singlet due to a shipment problem, I gave up and decided to head home. When I returned the next day, it just took me a mere 5mins to get my race pack. Kudos to the organisers for ensuring that the queueing time was drastically reduced. I almost sweared that I would not sign up for Pocari next year for the ‘bad experience’ but their service recovery was excellent. They gave me an ASICS shoe bag in place of the singlet. So, I was an appeased customer! Taking a ride from a friend, my son and I arrived at the race village at the Float and made our way to the starting pen (including the mandatory visit to the potable loos first of course) after a brief warm-up. En route to the venue, it was drizzling and every runner was hoping the skies would clear before 6pm. 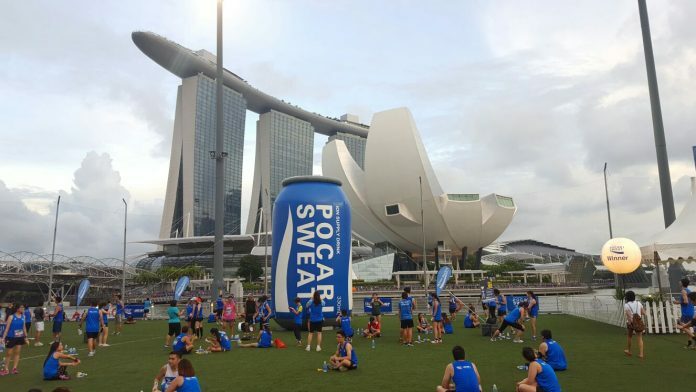 At around 5.30pm, the clouds thankfully cleared and the temperature dipped to 25degC to give us a cool start to this edition of the Pocari Sweat Run 2016. The 5km runners were flagged off first. After asking my son to run ahead of me, I strategised by doing a 5min jog+ 1min walk to ensure that I did not over-stress my knee and and maintained some decent momentum to last the distance. It was a humbling experience to run/walk in this way throughout the 5km; particularly so when runners began to overtake me when I was doing the 1min walk. I had to resist the urge to change my strategy and pace. I stuck to my 7min jog pace throughout and it worked fine. The weather was so awesome that even my run/walk routine was rather enjoyable. I increased the pace slightly as the distance increased. 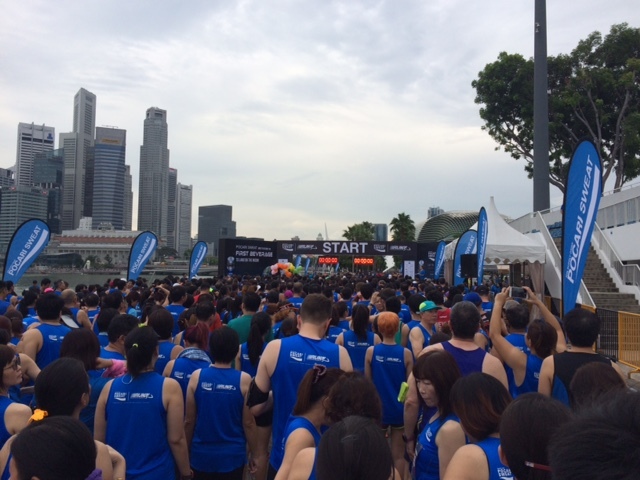 The hydration point for the 5km was only at the 2km mark and I gulped down just one cup of Pocari. I overtook the pink balloon pacers and was ahead of them from mid point onwards. Since it was a short race, there weren’t many cheering parties. 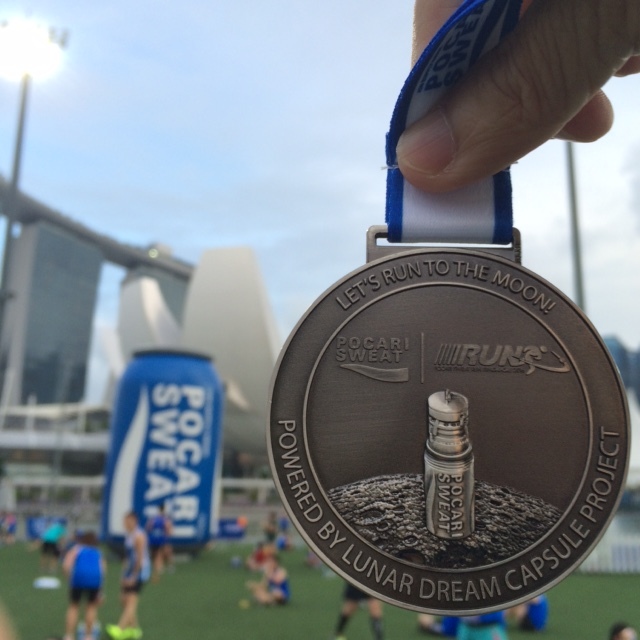 The route was also mixed with many other non-racing runners and weekend folks enjoying the sights of Marina Bay. The sea of blues along the entire route was quite a sight to behold. Even those who did not manage to get this year’s race singlet donned the previous year’s apparel just to be one with the rest of the blues. Everyone seems to be very happy, partly thanks to the cool evening. Nearing the last stretch of the route, I spotted the orange balloons who were the 35min pacers. I was trying to spot them so that I can be sure of doing 35mins. The last km saw the climb up the road next to the helix bridge and many runners slowed to just a walk; this was expected as 5km run usually comprised of not-so-seasoned runners (except for that few elite runners at the starting line-up who were vying for a place on the podium.) I found myself opening my stride up the bridge as I overtook the orange pacers. Applauding and thanking them, I went on to complete the last 5km in a reasonably good pace. Running through the finishing arch, I saw my gun time was about 34mins. When I checked my GPS watch, this was what I got (unofficial results) – which was a pleasant surprise considering I was still nursing a recovering knee. When the official results were released (the next day) my nett time was about 33:56 which exceeded my set target. However, what’s more important to me was that it was a easy run; giving me hope that I could be recovering well from my injury (discounting the fact that I was wearing a knee brace and took walking breaks along the way.) 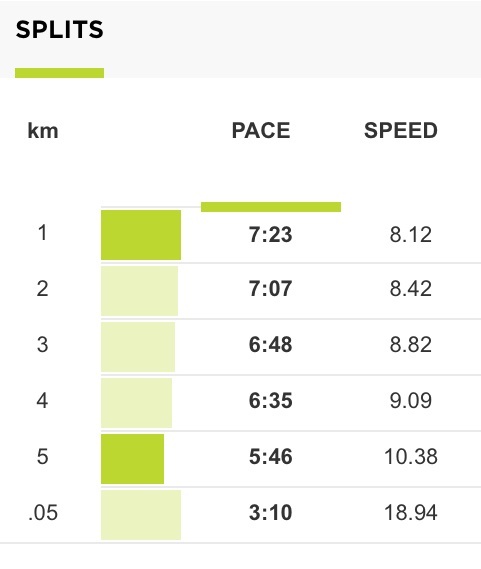 I still think an overall 6:45min/km was a decent pace. After crossing the finish line, I picked up my Pocari drink, banana and the finisher medal. This year, they did not give out any finisher tee but instead provided all loyalty runners with a Pocari windbreaker jacket. After the run, it’s warming down time and photo taking. 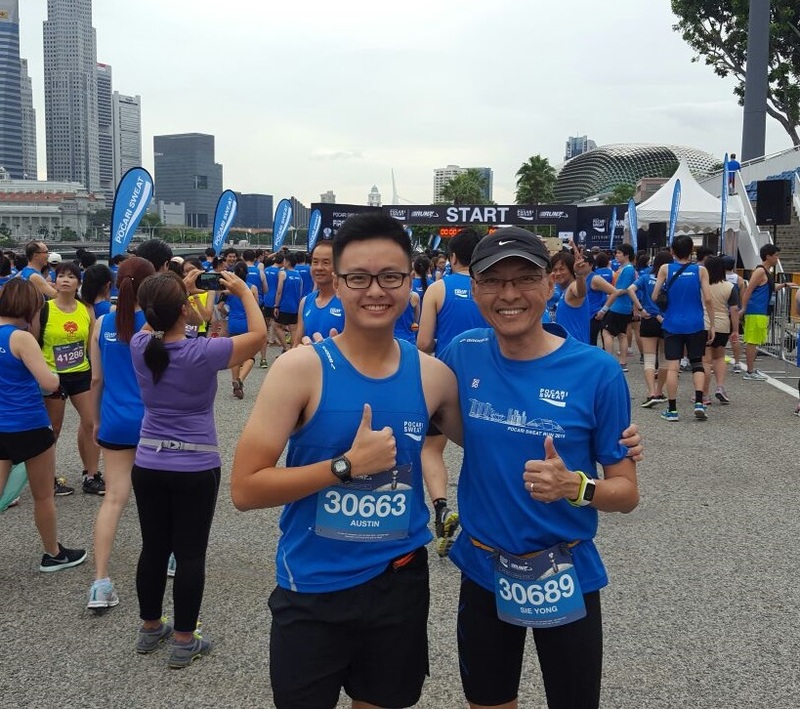 Unfortunately, most of my running friends were in the 10km category so I took a couple of photos with my son, Austin and went home happily. He, incidentally, finished a full 5mins ahead of me, and he didn’t train at all – the advantage of being young and strong! When I went home to count my medals, it was the 17th that I had accumulated since I started joining races in Dec 2014. 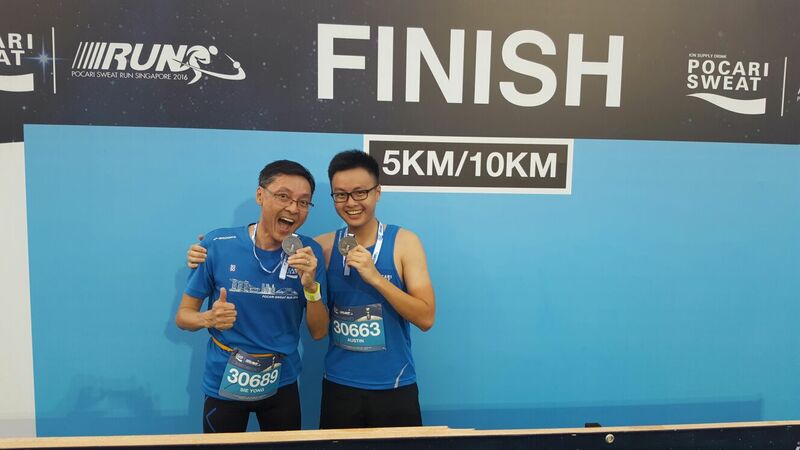 Then, I chose the blogging name “Beyond55” and now this race marked a new milestone for me. Even though I am nursing an injury, I continue to be optimistic to make a full recovery to run better (not necessarily faster). I have learnt from this recovery process that running for the long haul requires strength and not speed. I have also realised that to run strong does not mean running often or covering longer distances, it is about getting myself adequately prepped and trained to be a more efficient, versatile and stronger runner. Looking back over the last 2.5 months of rehabilitation and recovery, there are many lessons (shall save that for another post) learned. I know I am on the road to recovery. Although my knee has not regained its full strength and function, I am still glad to run this 5k pain-free at a slower pace. The runner in me wants to go further and faster; sign up for more races and resume normal training, but I have to say no to the inner voice. Having experienced the pain of injury; I am not going to compromise on the recovery process. So I am going to go slow; but I am going to be stronger – eventually. BIO: This journal chronicles my running journey since 2014 when I first started running for a reason. Click here for more post from SY.